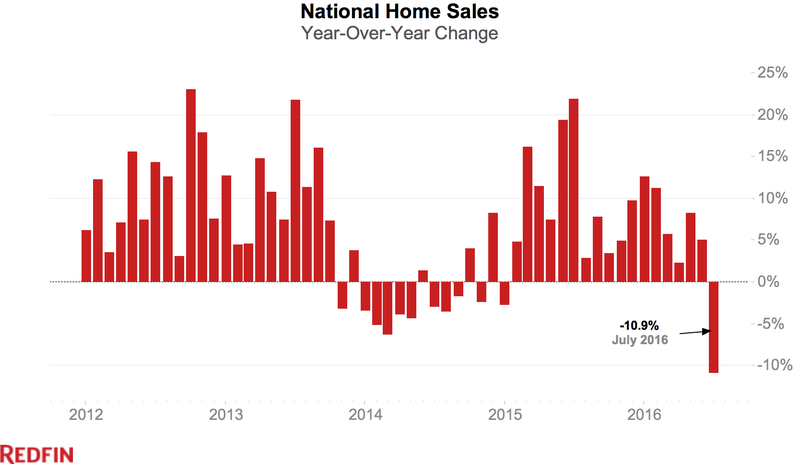 July posted the biggest national sales decline since April 2011, but most of the drop is due to the fact that business days, when people usually close on home sales, were fewer in July. Election anxiety, stock market queasiness and general economic malaise combined with the lack of available homes on the market to drive sales lower as well. A disproportionate number of markets in Florida and California saw sales decline this year compared to last year. Home sales fell 10.9 percent nationally as the median sale price increased 5.3 percent in July from a year ago. New listings slid by 6 percent, the largest year-over-year decrease in 2016, which has been a year starved of home supply. For the third month in a row, the number of homes available for sale fell by more than 6 percent. July posted the biggest national sales decline since April 2011, but there’s a good reason not to panic. The slowdown last month has more to do with this year’s calendar than buyer demand. Most of the drop is due to the fact that business days, when people usually close on home sales, were fewer in July. Because the month started on a Friday, there were five full weekends plus one national holiday, leaving only 20 days available for home closings. 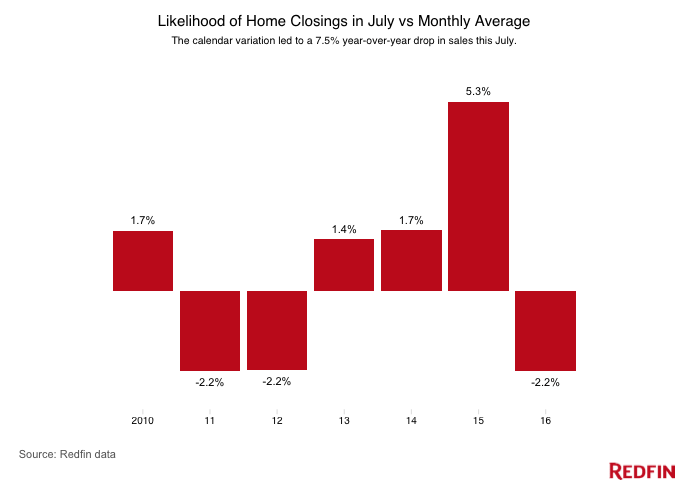 To determine just how much of the drop in sales can be attributed to the calendar, Redfin analysts calculated the average frequency at which home sales closed on each day in each month since 2010. Redfin data shows that the lion’s share of closings happen on Fridays. Homes very rarely close on Saturdays or Sundays. This July contained a below-average number of business days (2.3 percent lower than average), while July 2015 had the most favorable day-of-week setup for closings of any month on record (5.3 percent higher than average). Not all of last month’s sales decline was due to the calendar. Election anxiety, stock market queasiness and general economic malaise combined with the lack of available homes on the market to drive sales lower as well. 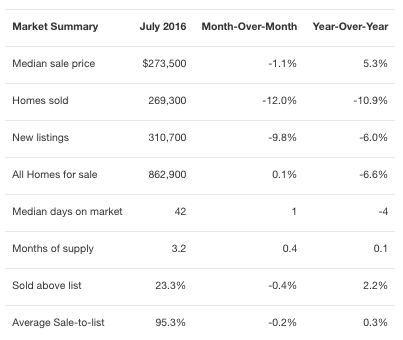 Redfin attributes roughly a third of the July sales decline to these slowing market trends. Despite July’s big miss, sales were up 4.8 percent in the first seven months of 2016 compared to the same period last year. Two-thirds of Redfin markets have seen sales increase so far this year. In contrast, a disproportionate number of markets in Florida and California saw sales decline this year compared to last year. Among East Coast markets, Miami, Fort Myers and West Palm Beach, Florida, saw the biggest year-to-date declines in sales. To the west, San Francisco led the drops, with an 8.8 percent decline so far this year, followed by three other Bay Area markets including Santa Rosa ( -6.6 percent), San Jose (-6.2 percent) and Oakland (-6.1 percent). Deltona, Florida, had the nation’s highest price growth, rising 15.8 percent since last year to $165,000. Only four cities saw price declines of more than 1 percent in July, including Washington D.C. (-3.8 percent), Hampton Roads, Virginia (-2.2 percent), Albany, New York (-2.2 percent) and St. Louis (-1.4 percent). 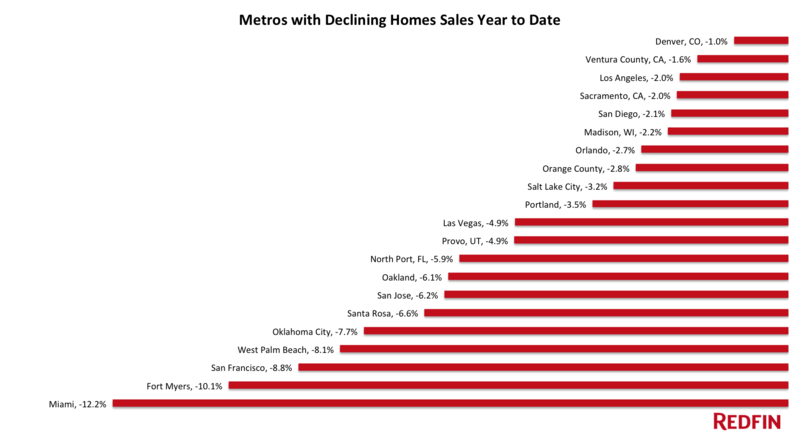 Only two metros saw sales surge by double digits from last year. Camden, New Jersey, led the nation in year-over-year sales growth, up 28.5 percent, followed by St. Louis, up 18.9 percent. Baltimore rounded out the top three, with sales up 6.2 percent from a year ago. Las Vegas saw the largest decline in sales since last year, falling 46.3 percent. Home sales in Allentown and Pittsburgh, Pennsylvania, declined by 32 percent and 30 percent, respectively. Denver was the fastest market, with half of all homes pending sale in just eight days, down from 18 days from a year earlier. Seattle and Portland were the next fastest markets, with eight and nine median days on market. The most aggressive buyers were in San Francisco, where 66.2 percent of homes sold above list price, followed by 65 percent in Oakland and 60.9 percent in San Jose. In sharp contrast, the sold above list percentage equaled 0 percent in Pittsburgh. Grand Rapids, Michigan, had the largest decrease in overall inventory, falling 40.4 percent since last July. Madison, Wisconsin (-28.5 percent), Fresno, California (-27.3 percent), and Albany, New York (-26.9 percent) also continued seeing far fewer homes available on the market than a year ago. St. Louis had the highest increase in the number of homes for sale, up 37.2 percent year over year, followed by San Francisco (35.9 percent) and San Jose (35.2 percent). You can download data from the July Market Tracker in an Excel spreadsheet. The tables that follow feature Redfin’s largest metro regions. For all of our data coverage, visit the Data Center. 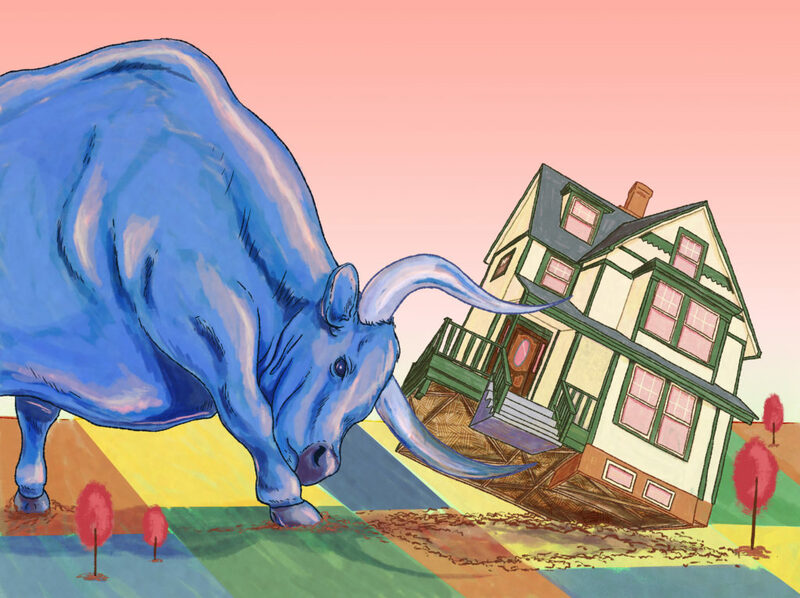 Why are the Fed’s beloved models failing in forecast?